I firmly believe that we should never criticise others until we have a walked in their shoes. Do you recall that saying? Born into a free and democratic Country in the twentieth Century I can not imagine what life was like as Europe was drawn into another war. I can not imagine waking up, living and going to bed scared, hungry and living all the time wondering who it is safe to trust. Neither can I imagine making decisions, that when it became clear they were the wrong ones, being forced to endure life with those poor choices, made out of desperation. As I read this book which is a true account of the author's life, although the names have been changed and the book is written in the third person, I was often in awe of how the author managed to live with those decisions. How did she keep her emotions in check as she grieved for her parents and the loss of her free existence? I get a sense that the book has been toned down from the horrors that she would have observed. The patience that was exhibited to her husband is overwhelming and I am quite sure he deserved none of it. The decisions to move to Canada and to go into teaching, to follow her dreams. Having got to the end of the book I wasn't sure I could compose a coherent review. I am a reflector and felt that I needed to think about the book after I had read it. None of us can truly imagine how the author's life was. 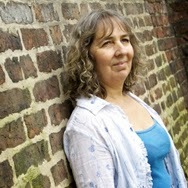 In fact we can not be sure that this book encapsulates her life entirely, only what she chose to share with the readers. Overall I enjoyed the book, I loved how the characters evolved and I felt that they had been bought to life, so that I cared and felt a variety of emotions with them all. 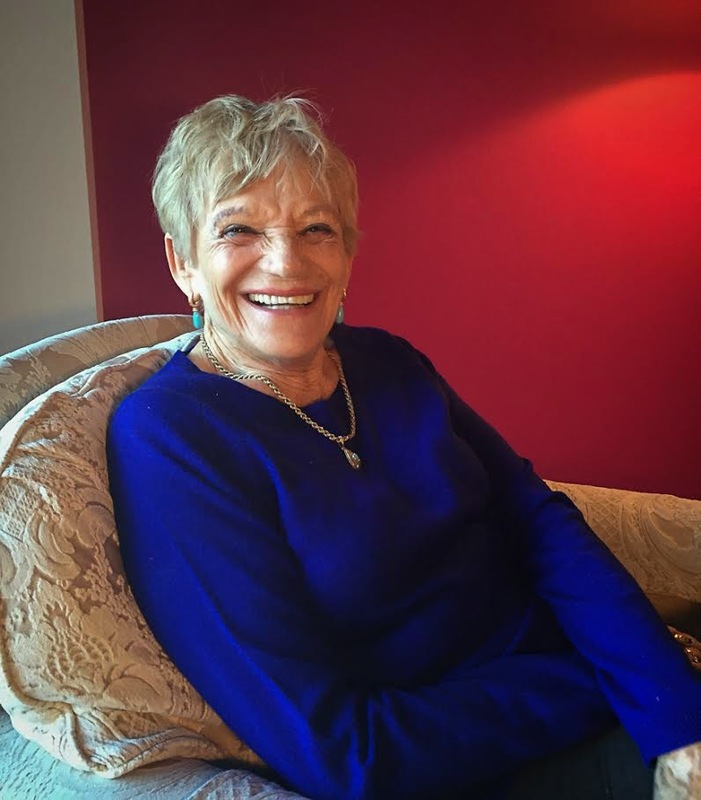 Today Historical Tapestry brings to you an author interview from Irene Even. 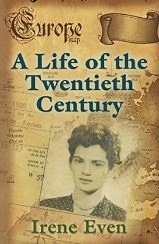 A Life of the Twentieth Century is written in the third person and fictional names, but all events and places are true. This is Irene's life story. 1) Why did you decide to write a memoir? The writing of my memoir wasn't so much a decision but a natural follow up to a life that needed a rational interpretation of all that I have lived through. 2) Was it difficult to remember some of the painful incidents of your childhood when writing the book? My painful memories were hidden so deep inside of me that most of the time I was not aware of them. It wasn't until I sat in front of the computer that those hidden memories appeared to me on the screen as if ​it​ was a new revelation. 3) Would you consider your book inspirational? 4) How did you write your book? Did you first jot down all your ​memories​ or did you just decide to write and see what came of it? The writing of my memoir was the most amazing experience ​for​ me because I had​ never ​known​ what I was going to write about once I set out to do it​. I never kept a diary or made notes; I just sat down in front of the computer and the story ended up​ writing itself, while I was only the facilitator as I worked the key board. 5) Why do you want people to read your story? When I first wrote my story I didn't have readers in my mind, but now that the story is written I would like people to read it because it is a true and incredible story, even to me​. 6) Writing about past events and family members may cause hurt feelings. Did you worry about what your children would think when you wrote you​r story? 7) How long did it take you to write your memoir? A review of the book will be published tomorrow. After hosting the Historical Fiction Reading Challenge for several years now, I have decided that it is time to pass the baton on to someone else to run the challenge! Straight away I thought of a couple of bloggers who I thought would be the perfect host for the challenge, and luckily, the first person I asked said yes, they would love to host! I hope that you all agree that Passages to the Past is the perfect home for this year's challenge! 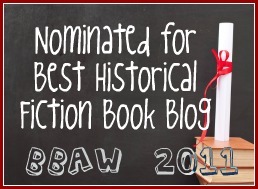 Amy is so active in the historical fiction community and has great passion and energy for blogging, for working with authors, for supporting others and for historical fiction in general! The sign up post will be up shortly and I hope that you all support her in the same way you have supported us here. I have loved hosting the challenge, and constantly been astonished by how many books get read, and how wide the variety of historical fiction there is available. I know that I leave you all in good hands! Quilts – I love quilts. The cozy feeling I get when snuggled beneath my quilt is like getting a hug from someone I love. They are one of the staples in my home that my family has grown to appreciate and love almost as much as I do. But what I feel for quilts is more than just an affinity for the actual, tangible thing that I wrap myself in each night; I love quilts for their mystery and the history they hold in their stitches and for all the memories they pass on for future generations to uncover, treasure and in my case – write about. To understand just how a quilt can hold memories, it is important to understand what goes into making a quilt. It is a lengthy process that entails design consideration, fabric selection, gathering, cutting, sewing, sewing, and more sewing, block layout, more sewing, then layering, more design consideration for the quilting, more sewing and finally, the finishing process of binding up the unfinished edges. Hopefully, the quilt is given a label, too – but not usually, otherwise it wouldn’t be such a mystery. Throughout the quilt making process, knowledge about the maker and a record of the times are often stitched into the folds of the object. The mystery comes in trying to decipher this knowledge. When designing a quilt, the maker considers the news of the day and the interests, desires and life altering events of the quilt’s recipient, as well as her own interests, desires and life events. For example, use of the heart design may indicate a marriage or death quilt, trees or the house design may reflect one’s love of family or home, and signature blocks with endearing sayings of remembrances may be used for someone leaving a community or for someone being left behind. 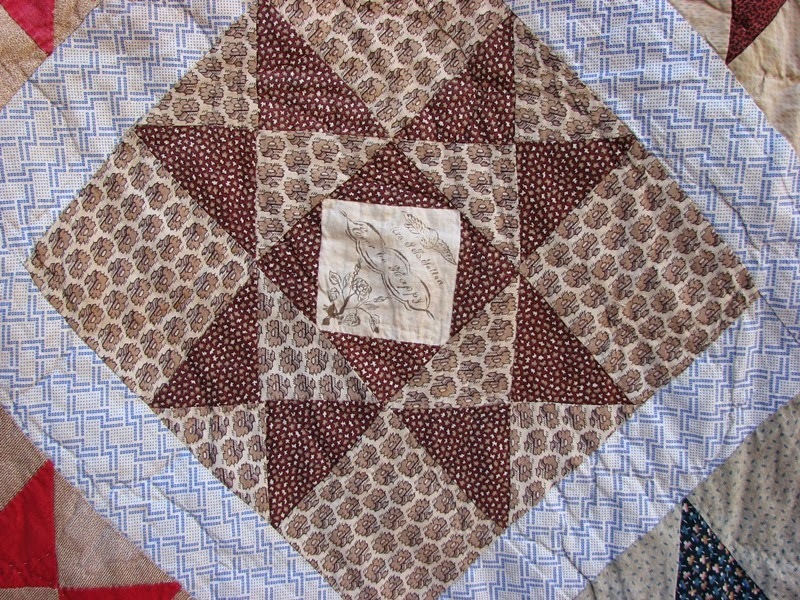 (See figure 1 and 2 for signed quilt blocks from an 1850’s quilt.) 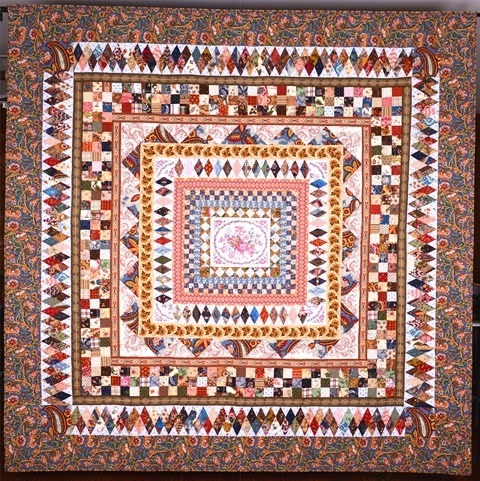 Even religious, political and organizational affiliations can be represented in the designs of some quilts, both in the selected design (e.g., Temperance Block for the prohibitionists) and the fabrics chosen for the quilt (e.g., political ribbons or fabrics depicting government figures like presidents or war generals for the patriots). Having a basic understanding of history, some knowledge about a person’s life events - as can be found on Ancestry.com - and a bit of background regarding the symbolism found in a community can often lead to a greater understanding of why a quilt was made. 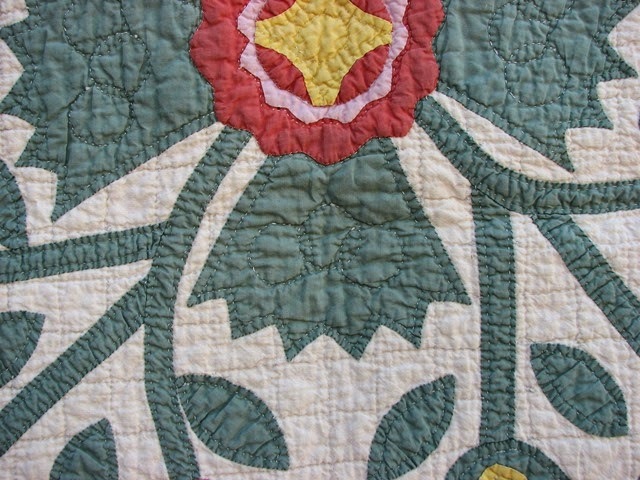 I love to find a quilt with little or no history and try to unravel some of the mysteries held within. The fabrics in quilts are usually quite beautiful. Every image conceivable can be found in both old and modern textiles. I love the variety of design and color, but my real love for the fabrics comes from a different perspective. Taking a closer look at the materials used to make the quilt can convey insight into the quilt’s secrets. A family legacy can be found in the fabrics that were selected to make a quilt. Sometimes, makers’ dresses gone out of fashion were used in quilts; old, quilted petticoats have also been found. 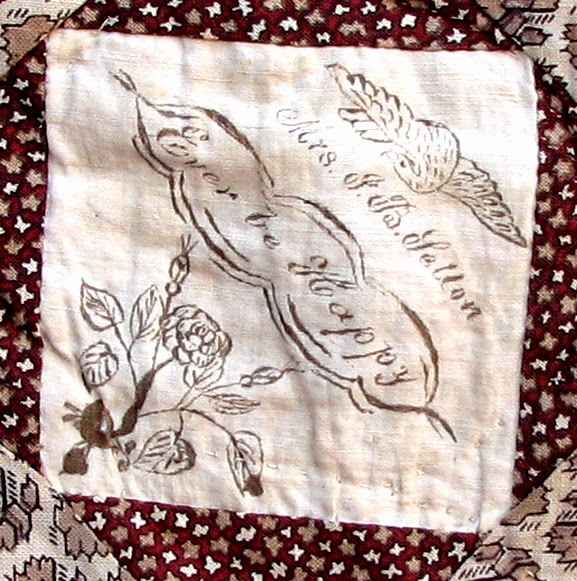 Relatives and friends would share bits of fabrics and close examination of quilts from the same community will often reveal many of the same prints – this is often found in signature quilts from the Quaker communities. Makers would use feed sacks from the family farm; even salesman sample card fabric swatches from Papa’s mercantile store can be found in some quilts. A maker’s frugality can often be seen in fabrics they used; recycling was being done long before it was hip. But not just a maker’s economy, the family’s prosperity can also be seen in the costly yards of a French chintz fabric that was used to make up a quilt’s backing or in the finely made binding of store-bought, woven tape. The materials used to make a quilt imparts wisdom that bring me closer to understanding the circumstances of the maker, the owner and history of the textiles of the time, and for this reason I love the fabrics. Mother Morgan’s Framed Angel Quilt – Made by Leah Zieber 2014 (a quilt from the novel.) This quilt is full of fabric that I love! Quilt makers often remained anonymous, but many left pseudo-signatures hidden for only the most discerning eye to find. Looking closely at the quilting can reveal a lot about the maker or makers. Hidden in the multitude of stitches that hold the quilt layers together I find many clues to the quilt’s mystery of whom, why, where and when. Differences in the quality of quilting stitches can reveal a group project such as a quilting bee or perhaps a teacher and student (i.e., mother and child). Symbols stitched into the quilting can help define a particular region from which the quilt may have come or an association with a group. (e.g., The Order of Odd Fellows were often represented by the three interlocking chain links or circles. See Figure 4. ). The type of thread used for the quilting (two-ply or three) can reveal when a quilt was quilted. Occasionally, just the tiniest of initials cross-stitched in a corner can confirm or reject a names associated with the quilt. And sometimes, but not often, a quilt has a goldmine of information stitched into the designs – names, dates, locations, even the occasion for the quilt have all have been found in the quilt stitches. There is a secret held in the stitches that brings me closer to the legacy waiting to be revealed. It takes patience to thoroughly examine a quilt, but my patience is usually rewarded with fragments of information about a person or people, about an unknown place and about the events of a time in history that, without the quilt, may have remained forever lost to posterity. I love the mystery, I love the history, I love quilts. Thank you so much, Leah, for this thought-provoking guest post! I never would have guessed the mysteries hidden within a quilt...I need to go back and look closely at some my grandmother made! Readers, please be sure to continue below for more about Leah's book, Libby Morgan: Reunion, and check out the rest of the blog tour! American quilt history and reproduction quilts from the nineteenth century. Her quilts have been exhibited across the country in quilt shows, museums and historical societies and were most recently published in Stars: A Study of 19th Century Star Quilts. Leah has worked closely with Southern California collectors, cataloging, managing, and independently researching their textile collections. 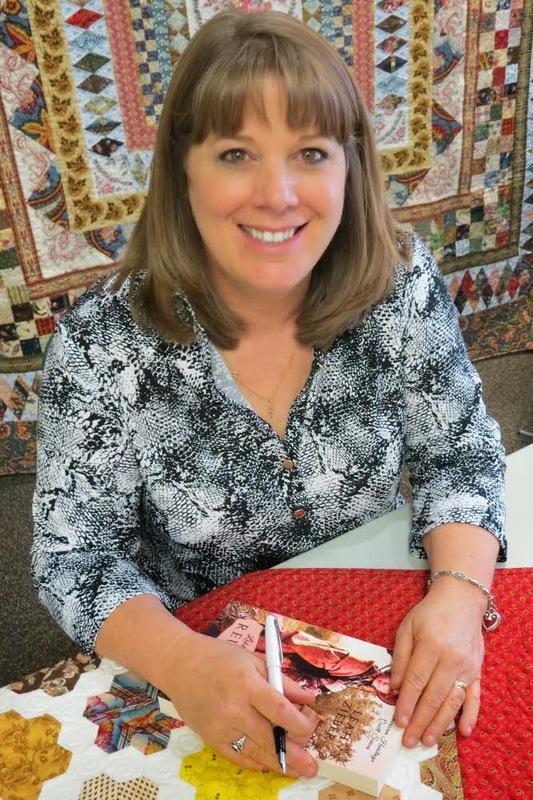 Her own collection of antique quilts and related textile items spans one hundred and eighty five years, and she shares her knowledge of American quilt history using her collection in lectures and workshops. 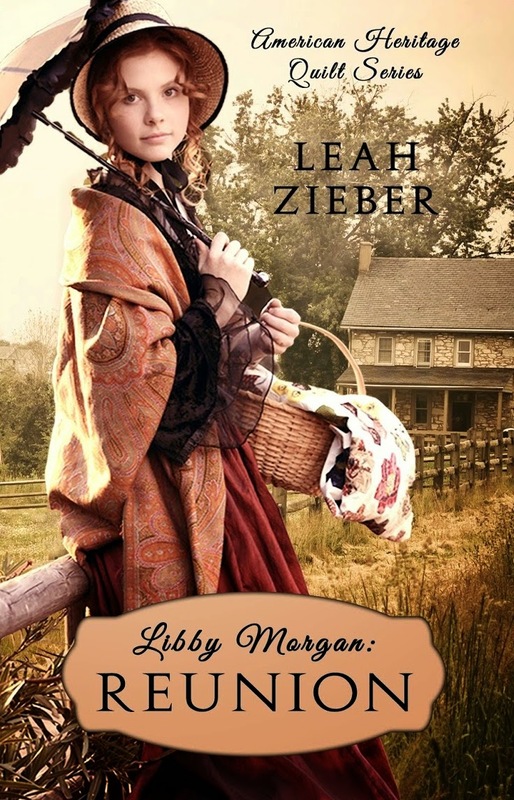 Libby Morgan: Reunion is her debut novel and the first in her American Heritage Quilt Series. Ah, Christmas...my favorite time of the year! I am one of those happy suckers who get so excited when the lights start coming out around the neighborhood and the Christmas movies and music are everywhere. So let's just say I was really excited when I saw that the always delightful Michelle Stockard Miller from The True Book Addict was organizing a Bookish Secret Santa event on Facebook. I was in! To my absolute delight the smaller package had a real mistletoe inside that I have already had my husband hang up...it is so pretty! The bigger package was the real surprise for this bookie girl...a SIGNED copy of Jodi Picoult's newest novel, Leaving Time. A SIGNED COPY!!! Being that Jodie Picoult is one of my all time favorite writers this one is going on the forever shelf to be loved and savored and kept safe. I cannot wait to read it! 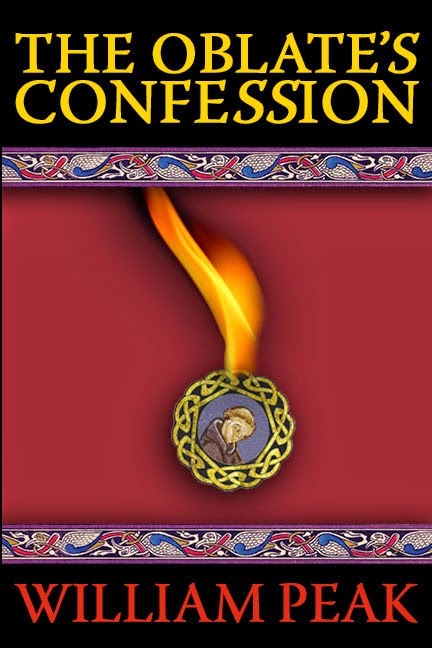 William Peak spent ten years researching and writing The Oblate’s Confession, his debut novel. Includes bonus material for reading groups. WWII seems to be a hot topic in novels nowadays and I am one of those readers that eats it up! There is just something about the horror and sacrifice intermingled with the determination, bravery and sheer will to not only survive but to come out the other side stronger than ever that gets me every time. Most of these stories seem to take the reader to the frontlines of the battles or into the homes of those left behind to pine for loved ones fighting. Brief Encounters, however, is the first I have read that gives us an inside look at what it was like for British soldiers forced to work for the Germans in prisoner of war camps as well as the complicated emotions of someone left behind who is ready for her life to begin even while those around her expect her to put her life on hold for a man she barely knows. These varied topics really pulled me into Brief Encounters and kept me turning the pages to find out how the story would unfold. The story goes back and forth between 1955, when Rhoda Middleton discovers her husband Peter has been hiding an entire part of his life from her since he returned from the war, and the late 1930s through 1945 when Rhoda and Peter meet, go through a quick courtship and Peter enlists and goes off to become a driver and finds himself a prisoner of war . Mostly alternating between Peter's and Rhoda's points of view, the reader gets to see first hand the struggles both of them go through during the war and what they hide from each other when Peter returns, leading to the marriage difficulties they are facing in 1955. When we first meet Peter and Rhoda in 1955, their marriage of ten years seems to be a complete shame with no real relationship, either physical or emotional, and with both of them just going through the motions of everyday life. It isn't until Rhoda finds a letter from a woman named Helen and she thinks Peter is having an affair that she finally learns how little she knows about her husband's past and what he went through while he was in a prisoner of war camp. As she builds a friendship with Helen, the wife of a man Peter survived the camp with, she begins to better understand the man she's married to and how her secrets have served to put a wedge between them as much as his. It is only with being honest with each other and letting their guards down that they might stand a chance at a happy life together. The most captivating part of this twisting story for me was Peter's time in the camp. Davina Blake does an exceptional job of plopping the reader into the camp and making them feel, hear, see what these prisoners had to go through. The descriptions of what would go through their minds and what they experienced really helped not only to immerse me in the action but to somewhat explain why Peter becomes this different man when he goes home. Watching Peter and his fellow prisoners not only try to survive but retain some humanity was inspiring and I won't soon forget their stories. While Rhoda's side of the story is less dramatic and attention-grabbing I did enjoy seeing her struggle against what she believed was expected of her as a "fiancée" (although you can barely call Peter her fiancée while he is serving as he asked her so abruptly before leaving for the war) and what her heart was telling her she wanted out of life. I couldn't help but feel for her, left at home with a less than perfect family life, always expected to find something useful to do with every second she had to spare, and wanting nothing more than to live a little as any red-blooded young woman in her early twenties would want to do. I don't want to give too much away regarding the secret she has kept hidden from Peter but it is quite bittersweet and even when I finished the story I couldn't help but feel that she never really got what she wanted out of life. Brief Encounters is a long but enticing story of the endurance of the human spirit, the hunger for love and appreciation and how secrets can fester and tear people away from each other. I only wish that the author had included an author's note at the back of the book that explained more about the real Great March of prisoners of war (something I knew nothing about) and maybe more facts regarding the loses sustained during the war (and I know I could just look this up online but I always enjoy turning that last page and finding that information ready to drive home the reality of what people such as the ones found in the book actually experienced). I highly recommend this to any lover of WWII history! I think its very pretty and I like the idea of the misty, grey man and background being the past that Rhoda is trying to forget. 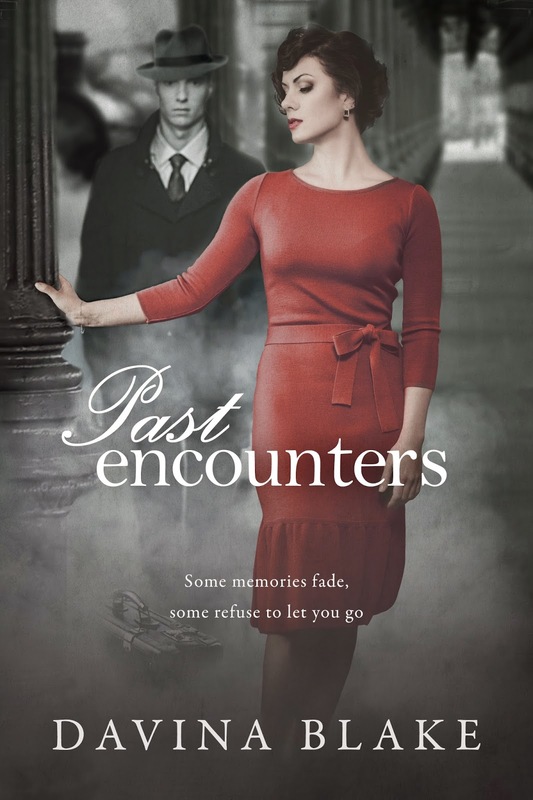 Thank you to Amy at Historical Fiction Virtual Book Tours for providing me with a free copy of Past Encounters in exchange for an honest review! Make sure to continue below for more information about the book, the author and the rest of the blog tour.